1 16 1⁄2-ounce can pitted cherries—do not get rid of the cherry syrup! 1. Combine currants and 2 tablespoons of wine in a small bowl and soak for 15 minutes. Drain the cherries, cutting them up, and then drain the currants. 2. Puree ricotta cheese, sugar, the rest of the wine, and the heavy cream until smooth. Mix in currants and cherries in a larger bowl. 3. Cut the pound cake lengthwise into 3 horizontal layers, placing one layer on a platter. Spread half of the filling over it, place a second layer, and spread the rest of the filling over that. Then, you guessed it, top with the third layer of pound cake. 4. Refrigerate for about 2 hours so it can get firm. 5. Make the chocolate frosting by combining the cherry syrup, semisweet chocolate, and ¼ cup of wine in a saucepan. Stir over low heat until the chocolate melts, then remove the heat. Add unsalted butter and let it melt. Put the frosting in the fridge so it can thicken. 6. Put 1 cup of chocolate frosting into a pastry bag— do not let Alberta do this, she’s terrible at it—and spread the rest over the sides and the top of the cassata. Use the pastry bag to decorate the top of the cake with swirls and rosettes. 7. Refrigerate the whole shebang for a few more hours. 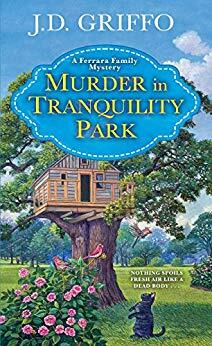 I would love to read these cozy mysteries!